You can do some limited movie editing in camera on the Nikon D7100 — limited editing. You can trim frames from the start of a movie and clip off frames from the end, and that’s it. Display your movie in single-image view. Press OK to begin playback. When you reach the first frame you want to keep, press the Multi Selector down to pause the movie. You see the menu options shown on the left. Highlight Choose Start/End Point and press OK.
You see the options shown on the right. Choose Start Point and press OK.
You’re returned to the playback screen. Press the Multi Selector up to lop off all frames that came before the current frame. Now you see the options shown. To preview the movie, select Preview and press OK; after the preview plays, you’re returned to the menu screen. 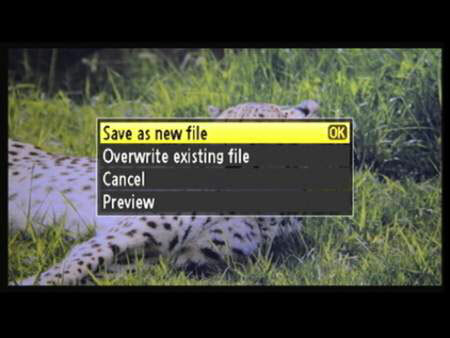 To preserve your original movie and save the trimmed one as a new file, choose Save as New File and press OK.
Alternatively, you can opt to overwrite the existing file, but you can’t get the original file back if you do. A message appears telling you that the trimmed movie is being saved. During playback, edited files are indicated by a little scissors icon that appears in the upper-left corner of the screen. To instead trim footage from the end of a film, take the same steps, but this time pause playback on the last frame you want to keep in Step 3. Then, in Step 6, select Choose End Point instead of Choose Start Point.